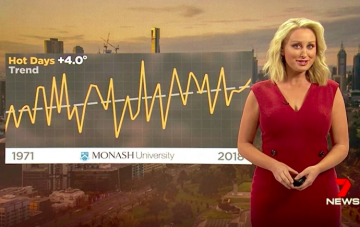 The Monash Climate Change Communication Research Hub conducts social research and leads impact focused projects to build media and policy infrastructure that adequately addresses climate change in Australia. Our impact-focused projects aim to improve public understanding of climate change by delivering climate information to audiences through existing media infrastructure. Our research investigates public attitudes towards climate change, how the media reports on climate change, and how Australia currently engages and could further engage with climate science. The MCCCRH works with a broad range of partners from television networks and local newspapers to other universities. In partnership with the Royal Society of Victoria and Monash's School of Media, Film and Journalism, we are delighted to present "Communicating Science in a Post Normal World." Join us on Friday the 7th of June as we explore how to navigate a rapidly evolving scientific landscape at a time where public trust in science is shifting. Hear a keynote address from Professor Mike Schäfer (The University of Zurich), who will then join panellists Professor David Karoly and Dr Linden Ashcroft to explore this process, highlight the challenges and identify future directions for science communication. Limited free tickets are available at the Eventbrite link below. We are delighted to announce that our flagship program, #ClimateCommunicators had its debut broadcast in Queensland earlier in the week, with 7NEWS Brisbane's Tony Auden presenting on an increase in the number of days above 30C that Queenslanders have been experiencing recently.